ARHGEF10-transfected 293T cell lysate. HeLa cells. Our Abpromise guarantee covers the use of ab168936 in the following tested applications. WB Use a concentration of 1 µg/ml. Predicted molecular weight: 152 kDa. May play a role in developmental myelination of peripheral nerves. Defects in ARHGEF10 are the cause of slowed nerve conduction velocity (SNCV) [MIM:608236]. Affected individuals present a reduction in nerve conduction velocities without any clinical signs of peripheral or central nervous system dysfunction. SNCV inheritance is autosomal dominant. 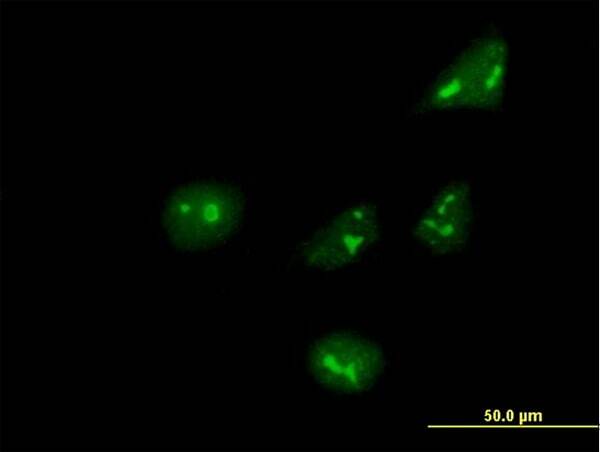 Immunofluorescent analysis of HeLa cells, labeling ARHGEF10 with ab168936 at 10 µg/ml. ab168936 has not yet been referenced specifically in any publications. Publishing research using ab168936? Please let us know so that we can cite the reference in this datasheet. There are currently no Customer reviews or Questions for ab168936.